Pablo Picasso Family of Saltimbanques, 1905 National Gallery of Art. 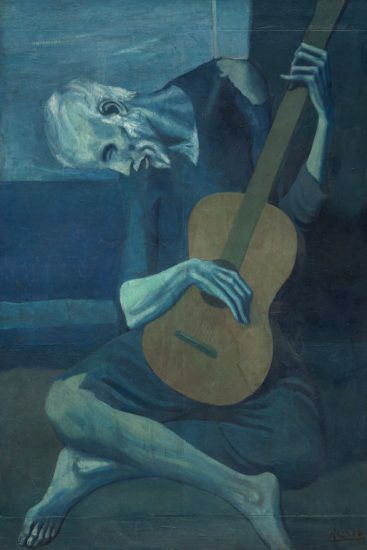 After exiting his Blue Period, Pablo Picasso entered his Rose Period. A notable thematic change was the move to saltimbanques or harlequins – transient circus performers. He portrayed them in daily life, with their families, as opposed to performing. In many of the etchings and paintings, the characters are very still, which is at odds with their characterization as acrobats. 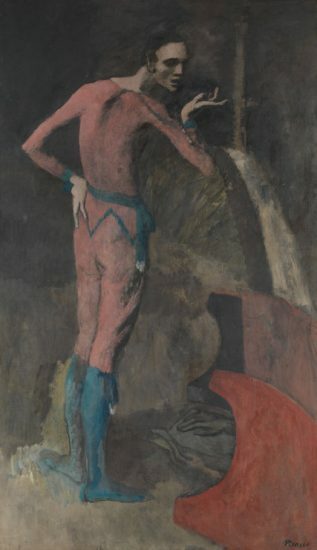 Picasso felt a certain kinship with them as he “was transient during the first years in Paris while striving for recognition.” After he got his feet under him and moved into the Montmartre neighborhood, Picasso and friends would frequently attend the Cirque Medrano. His fascination with circus performers continued. Often the subject matter of these works felt very intimate and personal. 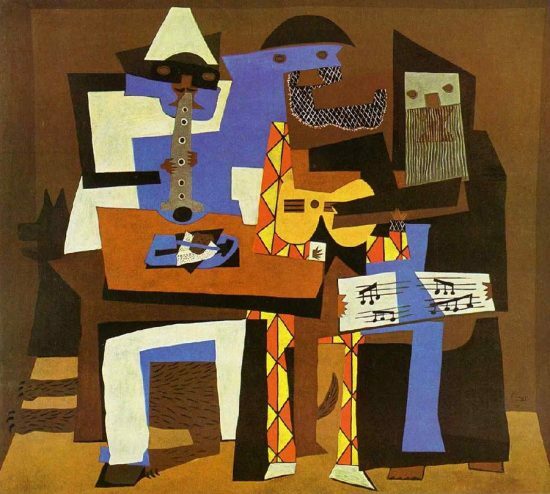 Picasso himself identified with the persona of the harlequin, and would insert himself and his friends into his paintings and etchings. In Family of Saltimbanques, it is suggested that he is the harlequin on the right, and that the little girl is his deceased younger sister Conchita. The woman on the right has been said to be his lover at the time. Other etchings show a family consisting of a mother, father, and child. 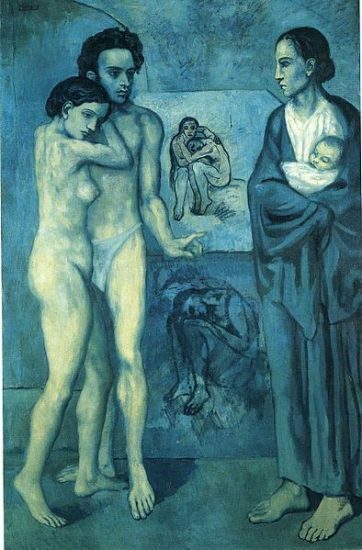 Some think that this was a private fantasy of Picasso’s where he is again the male harlequin with his lover and nonexistent child. 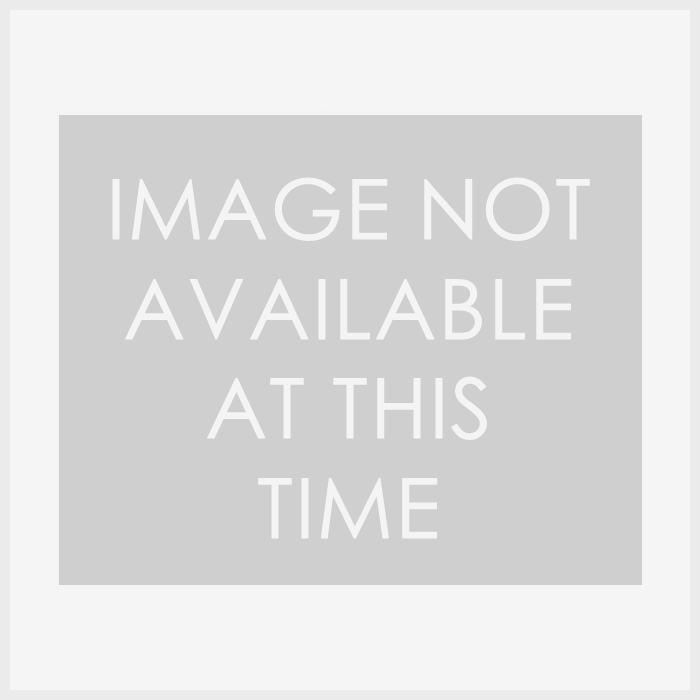 He was also no doubt influenced by the work of his poet friend Apollinaire, who frequented the subject of saltimbanques in his own work. 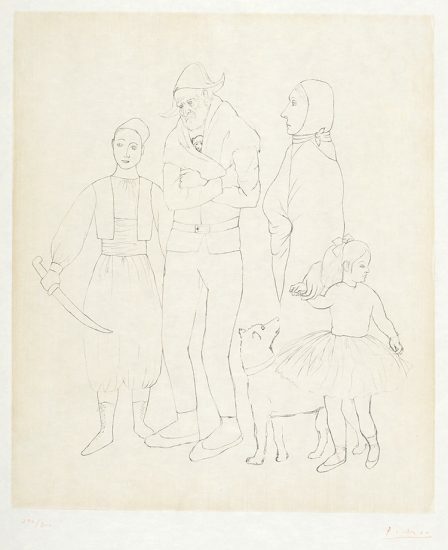 Picasso “dedicated a number of prints in the Saltimbanques series to Apollinaire with handwritten inscriptions,” leading to the assumption that the pair planned to jointly write and illustrate a book on the subject together. All these studies of saltimbanques culminated in Family of Saltimbanques, 1905, a monumental canvas measuring 7 x 7 1/2 feet. Wye, Deborah. 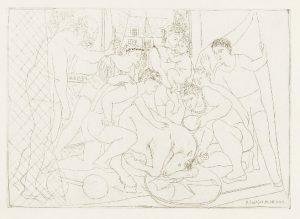 A Picasso Portfolio: Prints from the Museum of Modern Art. New York: The Museum of Modern Art, 2010.